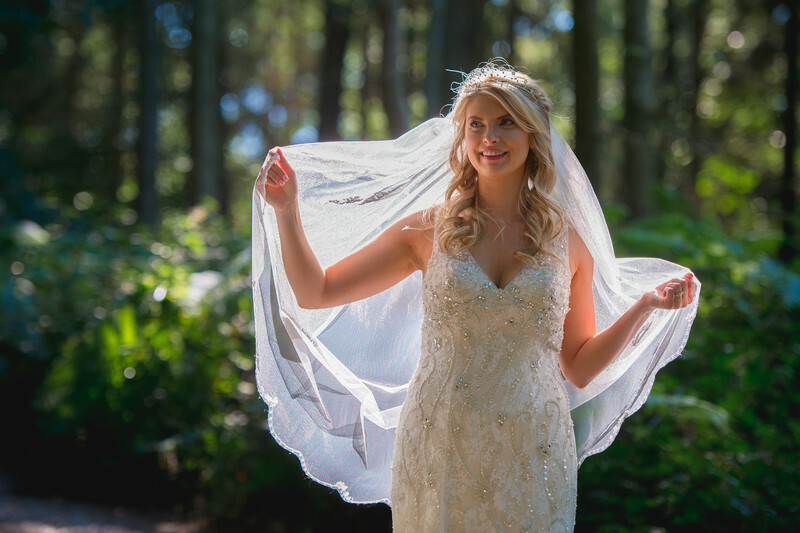 Liam and Lora got married the middle of summer and hosted their wedding reception at what you might consider an unconventional location - Wyre Forest Visitor's Centre. The vast majority of my clients opt for a ready-made wedding reception venue, which certainly relieves some of the stress from the day - knowing that someone's going to get there and set up the venue, prepare all the food and tidy up once you've gone, but that doesn't always allow you to have the exact wedding reception that you'd always wanted. Having a do-it-yourself wedding reception however means that you can have things exactly the way you want them, if you're willing to work to make it all happen. When we arrived at Wyre Forest, the venue was stunning, and had been decorated on the inside by the bride and groom and their families. The building itself sits on stilts, meaning when you look out of the window you're half way up the trees, it's an incredible setting and makes you really feel a part of nature. After everyone had settled and the drinks reception was in full swing, I took the bride and groom for a walk through the woodland. 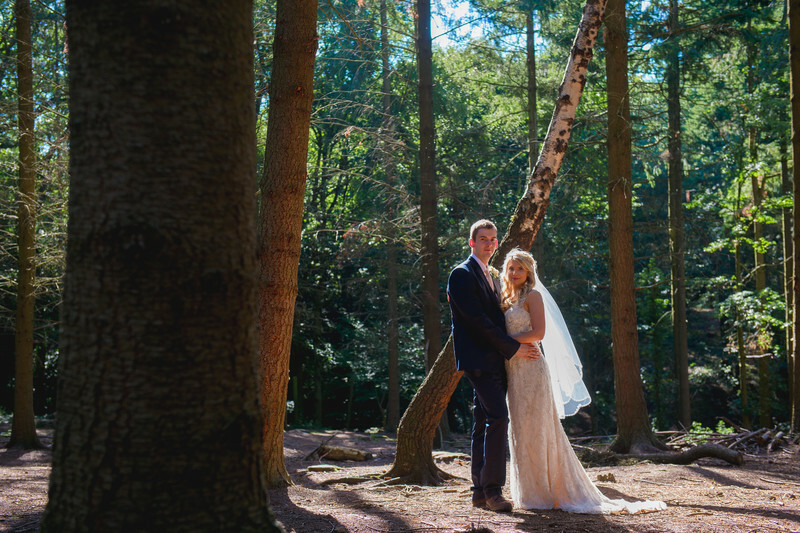 The dappled light coming through the treetops was gorgeous, and the light was really rich and warm - perfect for photos of the bride and groom on their own. I really like how I was able to use the combination of the bright direct sunlight and the dark shadowy background to really make the bride and groom stand out in these photos. 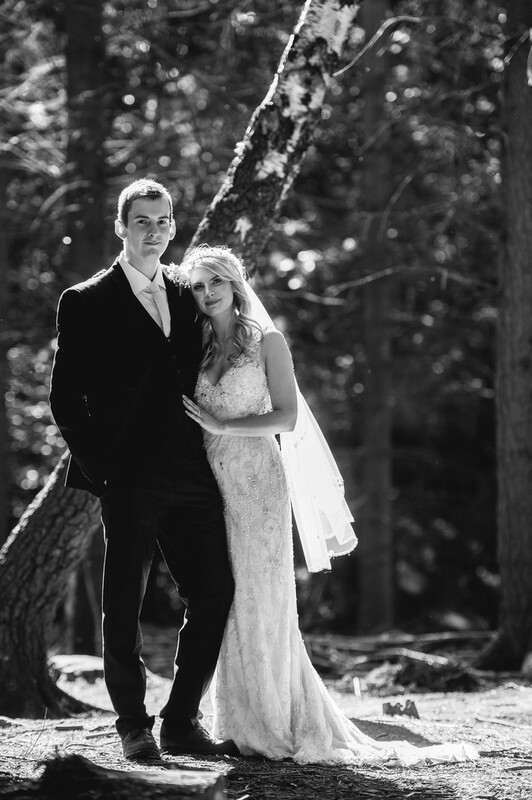 The main image, in black and white, is a personal favourite of mine from Liam and Lora's Wyre Forest wedding. I chose to make this image black and white to make sure that the colours in the image don't take away from the emotion that's at the heart of this image. I love the way Lora is resting her head on her new husband's shoulder. It shows a real loving intimacy, and that's my favourite part of this image. Removing colour from the image allows you to focus on that, instead of being distracted by the warm light and luscious greens of the trees.